Implement a regional plan to convert existing traffic signals to light-emitting diode (LED) lamps and develop a regional policy to install LED in future traffic signals. A goal-oriented regional plan to convert traffic signals to LED will be implemented in the nonattainment area. Where possible, the Regional Transportation Council (RTC) will identify and facilitate potential partnership opportunities with private sector energy companies that offer rebates for retrofitting traffic signals with LED technology. A subcommittee of the Surface Transportation Technical Committee (STTC) was established in Spring 2004 to develop a clearinghouse of information to describe benefits of available LED technologies and guidelines for implementation of these technologies. The conversion plan shall also consider the impacts of implementation goals on municipalities which do not purchase electricity from large private generators and are not eligible for rebates. The RTC will fund the program up to $400,000 for staff time and inventory development. The RTC may develop project selection incentives to ensure timely implementation of this program. •	Include LED lamps into existing and future Transportation Improvement Program (TIP) projects. 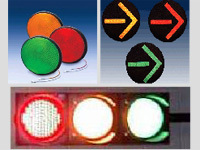 •	Include LED lamps in Thoroughfare Assessment Program (TAP).